Pinterest ads are paid, image-based posts on Pinterest called Pins. Pinterest ads show up as users browse their home feed or search for specific Pins or boards. Pinterest ads don’t differ visually from other Pins, which helps improve engagement from users and makes it a great choice for businesses with visual brands. Once you decide to use Pinterest ads as part of your marketing and advertising strategy, you may find that you need help setting up your ad account, managing your ads or creating captivating graphics. Consider using a marketplace like Fiverr to hire a Pinterest expert or graphic designer to help you affordably maximize your Pinterest marketing efforts. Pinterest is a social media platform that is like a web-based Pin board or bulletin board that allows you to organize individual pieces of content, called Pins into specific buckets, called boards. Pins are images that link to blogs, products or website. Boards are the way to categorize Pins and typically have a similar theme. The Pinterest ad platform works by allowing you to select a Pin, choose a target audience and a budget, and then promote that Pin by paying for additional Pinterest users to see it. Pinterest ads run on an auction system, called a pay-per-click (PPC) platform. To run ads, you’ll place a “bid” that indicates the maximum amount you are willing to pay to have your ad shown to your chosen target audience. You can put your ads directly in front of your target audience at a time when they are likely to pay close attention, engage with your ad and become a customer. Pinterest has two different places that ads can be seen. The first is in the homepage feed, which is seen by users who are browsing on Pinterest. The second is in search results on Pinterest, if the words used in a user’s search match keywords within the ad. Since 93 percent of Pinterest users use Pinterest to plan future purchases — of both products and services — it drives an incredibly high return on investment. In fact, for every $1 advertisers spend on Pinterest, they receive, on average, $2 in profit. Any business whose main target is women of any age should consider using Pinterest ads as women make up the largest demographic of the platform’s user base. Pinterest is unique because it can be used throughout your marketing funnel, not just at the beginning. Users can become aware of your brand, engage your brand, or purchase from you all on the Pinterest platform. If you would like to read more about how to create a marketing funnel, read How to Create a Marketing Funnel in 10 Steps. Pinterest ads aren’t just for bloggers and lifestyle brands. In fact, one example of a successful ad campaign is from a tax accountant who wrote an article on how to destress and unwind during tax season. 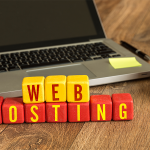 Links throughout the blog post allowed users to schedule a consultation call as a way to be confident that their taxes were properly handled. Different businesses get successful results with Pinterest by offering valuable content, tips and then offering a way to join an email or text message list, buy a service or product or sign up for a lead magnet. Getting started with Pinterest ads is simple. You will need to set up a Pinterest business account, as well as a Pinterest advertising account, and then start setting up your ads. From just getting started on Pinterest to having an Ad Campaign live, it takes about 90 minutes. Here’s how to set up your Pinterest ads in 14 steps. 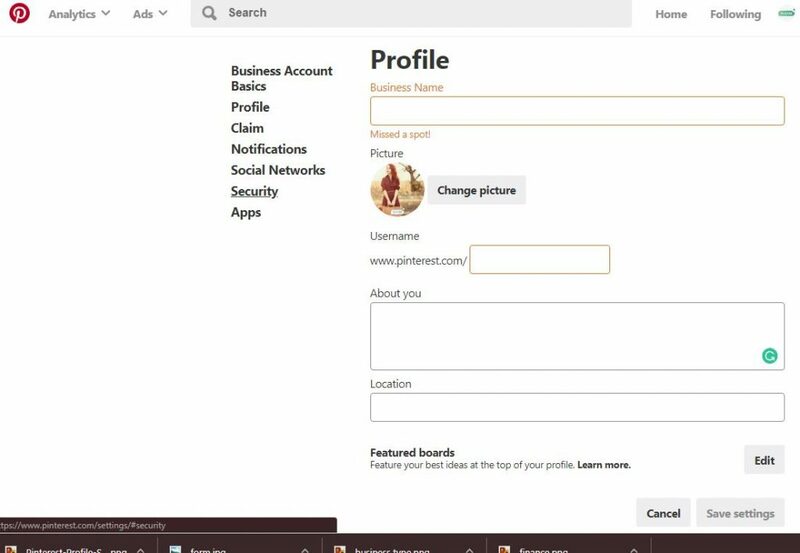 Setting up a business account on Pinterest grants access to critical advertising features, such as analytics, reporting, board showcases, and added profile elements as well as the ability to create a “Pin it” button for your website. Promoted and buyable Pins are also only available to those with a business account. Go to business.Pinterest.com. Once you land on the Pinterest business page, you will select “Sign Up.” Then, you will enter your email address, password and business name. Use some care when selecting your business name. Instead of just putting in the name of your company, stop and think about what people might look for if they were searching for your company on Pinterest. Incorporate keywords into your business name to ensure you can be found. Pinterest allows you to change your business name at any time, so if you want to change it later, you can. Adding a business name that is what you do as opposed to your legal business name won’t eliminate your branding, so consider it. After all, you will have a logo, colors and website as part of your profile as well. Below, you will see an example of how this will look to Pinterest users. 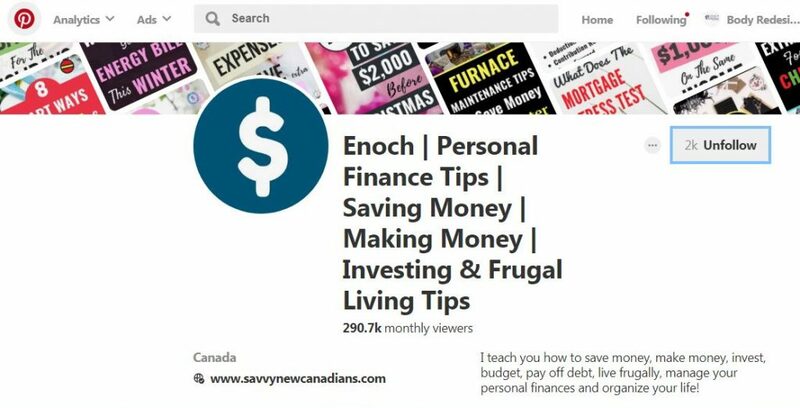 This company’s name is Enoch Financial. However, they choose the business name Enoch | Personal Finance Tips | Saving Money | Making Money | Investing & Frugal Living Tips. This profile has built a following of more than 10,000 people and garnered 290,000 monthly viewers. Selecting your Pinterest Business name. 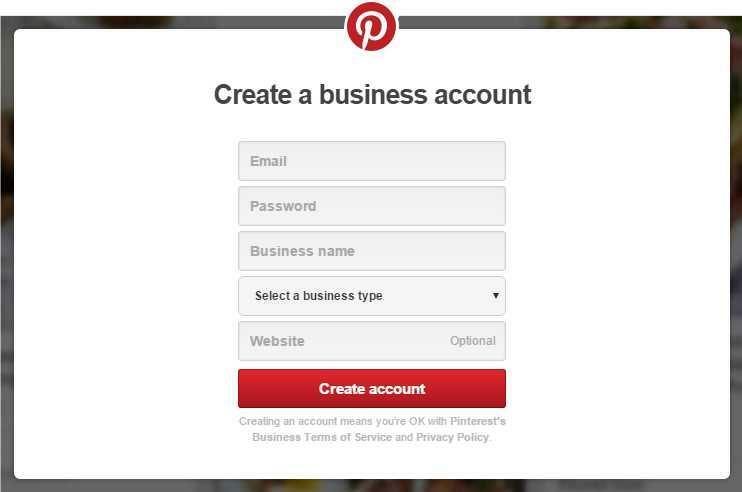 Now, you can go to Pinterest Business and start to set up your account by filling out this form. This will take you to Account Basics. If you scroll down that page, you will see a section titled “Profile.” Here, you want to fill out each section, including uploading your logo. You also want to take a few minutes to write a description that is interesting and has a few keywords that people may use when they are searching for what your business does or the type of products your offer. Filling out tour Pinterest Business profile. If you continue to scroll down your setting page, you will see a spot that says “Claim.” Here, you will want to enter your website into the box and hit the “Claim” button. This will allow you to track any Pins that are Pinned from your website. When users do Pin content from your website, your profile logo will show up next to these Pins. Once you hit the “Claim” button, you will be given instructions on how to verify and claim your website. These instructions will include placing a tag or code on your website for verification. You can insert this specific code on your website yourself or, if you need someone else to handle this tech-savvy step, you can hire someone from Fiverr to do it for you. Now, you want to set up your Pinterest ad account, which is where you put in your legal business name and address along with your billing information. The simplest way to do this is by logging into your Pinterest account and clicking “Ads” in the top left corner. This will prompt you to start creating an ad, and then will allow you to put in your billing details after you’ve created your ad. Pinterest tags are pieces of code that you place on the website page or landing page that users see when they click on your ad. This allows you to track users, gathering important website traffic data. Pinterest tags can also help you better define specific audiences to retarget as they capture demographic information on each user. In this article, Pinterest offers step-by-step instructions for how to do this. If you find that it’s a little too complicated or technical to install the Pinterest tags yourself, consider having someone from Fiverr do it for you. Before you start running ads to your Pins, you must create the Pin that you want to advertise. 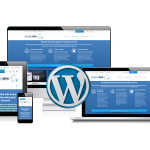 This involves picking colors and copy as well as any pertinent links and call to action (CTA). Here are the steps to creating Pins in Pinterest. Pinterest is a visual site, which means that pretty, creative and eye-catching Pins almost always outperform less-creative Pins. You want to grab the attention of the Pinners who fit your ideal audience and get them to click on your advertised Pin. Keep in mind the composition and ratio of the images as well as color contrasts play a critical role in getting the attention of your audience. Always use high-quality images so that no matter how big a screen a Pinner views your Pin on, it is crisp and clear. Also, never have a CTA on the image that you want to promote. You will include the CTA in the description of your Pin, but not in the image. Pins that include CTAs often get rejected by Pinterest, and even the ones that are disapproved generally have a much lower click-through rate (CTR). You want to be sure that your Pin is linked to the website, sales or landing page or blog post that you want to drive traffic to correctly. You will add that when you Pin it so that when it’s repinned (saved) or opened, it takes people to the correct link. In the description for your Pin, you want to add a description that includes relevant keywords, which is how Pinners might search for the content or information that your Pin offers. You also want to include the CTA in your Pin description. If you want them to click to learn more or to sign up, for instance, be sure you clearly state that in the description. Pinterest offers several different types of ads. They vary based on the type of content you want to promote. Choose the one that fits your overall goal the best. If you are looking for overall traffic to your content, you will choose a Promoted or one-tap Pin. If you are looking to increase views of your video commercial, you will choose a promoted video Pin. Example of a Promoted app Pin. Your campaign objective is what you choose inside the Pinterest Ad platform, and it determines your goal for this specific campaign, how will you bid to get viewers and what ad types are available to promote. Your campaign objective should support your business’s marketing goals like achieving increasing blog traffic or achieving a certain number of app installs. App install campaign: Run this type of campaign to get more installs for your app; you can choose to pay by install or by click; when you pay for installs, the Pinterest algorithm adjusts your bid daily (within the maximum you set) based on the likelihood of install’ when you pay for clicks, the ad is optimized for click traffic like a normal cost-per-click (CPC) campaign. 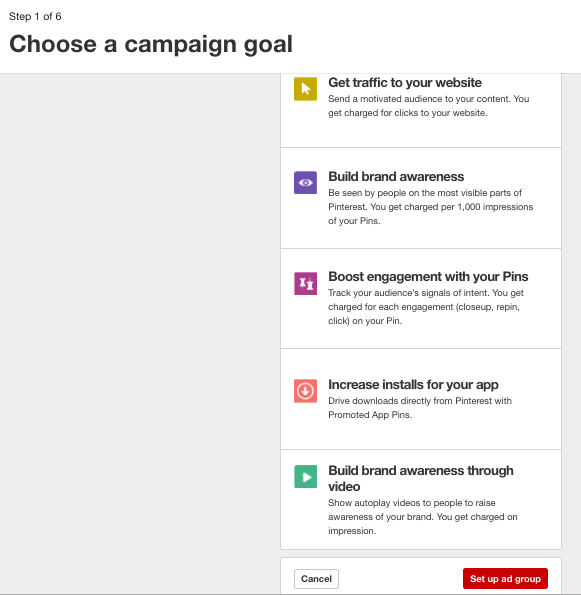 Choosing your campaign goal in Pinterest. Once you’ve chosen your goal, choose a name for your campaign. Then, you can set select optional campaign budgets and choose your ad placement. You’ll get into pricing later, so the budget you set here is the maximum amount you’re willing to spend during the entire campaign. These are capped to make sure you don’t go over your spending limit. You will be able to set a daily spending limit later in the ad creation process. For example, if you have a $1,000 budget to spend on new app installs, you would place that amount here. In the next step, you can choose how much you want to spend per day. However, once you reach $1,000, you will have to start a new campaign to spend more. Pinterest automatically sets your ad to appear in all placements, both Browse and Search, but you can click “Edit” to customize where your Pinterest ads will appear. If you select Browse, for example, your ads will show in the home feed and among related Pins. If you select Search, your ads will also appear in search results. For best results, you will want your ads to appear in both unless you are testing to see which placement performs better. Again, choose carefully, because you can’t modify your budget once the campaign is running. Selecting your campaign budget in Pinterest. Now, you’ll set up an ad group. An ad group is a group of Promoted Pins with the same campaign objective that you choose above. Name your ad group, and then choose whether to run your ad continuously starting right away or set specific start and end dates, the latter of which is optional. You’ll also choose an ad budget for this ad group. This is different from the budget you set for your campaign on the previous screen since a campaign can include more than one ad group. If you choose to run your ad continuously, you can set a daily budget that will apply each day until you end your campaign. You can target your Pinterest ads by interests, location, language, device, gender, keywords or even prebuilt audiences based on your own business data. The best ad campaigns use various combinations. For example, interests combined with location would be a fitting combination for a local home renovation company or device combined with interests to increase the app installs of a new networking app. Setting up ad targeting in Pinterest. Now, you’ll need to enter your maximum bid. This is the maximum amount you are willing to pay for each desired action — click, engagement or impression — on Pinterest. Pinterest uses a “second-price auction model” for ad bids. While that sounds complicated, it just means that you only pay the amount needed to top the next-highest bidder, so you won’t be charged your full maximum bid unless it’s required. Once you have your ad targeting options entered, Pinterest will suggest the best bid under the box that you are bidding in. If your budget allows, you want to get as close to that suggested number as possible. 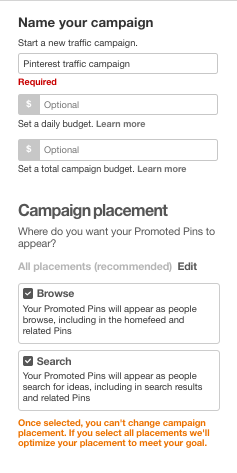 You can only promote Pins you’ve already added to a public board, so now’s the time to select the Pin that you want to run your Pinterest ads to. Review your Pin to make sure it has a good description with relevant keywords. On the next screen, “Add Pin details,” you can give your Pin an optional name. The more important thing you’ll do here is determining where on your website you’ll send Pinners who click on your Promoted Pin. Think carefully here about how best to maximize the traffic you generate. It’s often best to link to a landing page specifically targeted to Pinterest visitors, preferably one that directly corresponds to the Pin they’ve just clicked. Pinterest tags allow you to track page visits, sign-ups, purchases and custom conversions like saves and close-ups. You will want to look at the reports that these tags generate as well as Pinterest Analytics at least once a month to see what changes you might want to do to make your Pinterest ads even more effective. Keep in mind that you want to make one change at a time to gauge its success, and run each change for a full three business days before making additional changes. Start by refining your ad creative, which is the graphic and copy you created and used for your Pin. Many times, simple tweaks to your Pin to make it more attractive achieve the results you are seeking. The next option is to increase your overall audience. For instance, if you do business in both the United States and Canada, expand your targeting to include Canada too. 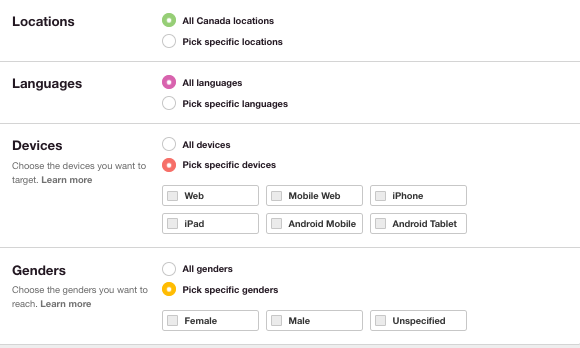 If you’ve been targeting one gender, try targeting everyone instead since targeting on Pinterest is based more on someone’s behavior (using interests or search keywords). This is an easy way to be seen by more people. If you are still not hitting your goals after changing the above elements for three full days each, you can increase your bid. By doing this, you can be certain that you’re bid is competitive enough to reach as many people as possible within your budget. Pinterest advertising is very nuanced, and there are certain “best practices” to ensure that your ads reach your desired audience successfully and received maximum engagement. How Do Pinterest Ads Compare to Facebook Ads? Pinterest ads focus on promoting content, instead of designated ads. Because of this, they are typically cheaper than Facebook Ads. Facebook Ads usually include a direct CTA or a direct link to buy, which makes them more expensive. Is a Pinterest Business Account Free? Pinterest will allow you to set up a Pinterest Business account, complete with analytics, for free. The only time Pinterest charges you is for ads that you run. Pinterest advertising is a form of advertising that utilizes visual content, organized in bulletin board format. Pinterest advertising is designed for businesses that want to reach potential customers through this visual content. It is a powerful way to grow the awareness of your business, boost traffic to your website, expand your email list of subscribers and increase your customer base. Once you’ve added Pinterest ads to your marketing strategy, you may need some help setting up your ad account, creating your Pinterest tags, or managing your Pinterest ads. Consider using Fiverr to hire a Pinterest marketing expert to help you affordably maximize your Pinterest advertising budget and results.